Rhubarb is technically a vegetable (although the United States Customs Court in New York ruled it a fruit in 1947) and belongs to the Polygonaceae family. It is a perennial plant (rheum rhaponticum) originating in northern Asia. The first rhubarb plants had green stalks, some with a touch of red. The color, size, season, and oxalic acid content of rhubarb can vary. However, do not eat the leaves of the rhubarb plant as they are inedible and toxic. The rhubarb you find in markets today can be either field grown or hothouse grown. Field grown rhubarb is identified by its bright rosy red and green tinged stalks with green leaves and has a very pronounced tart flavor. It is available from late winter to early summer. Hothouse rhubarb, on the other hand, has pale pink to pale red stalks and yellow green leaves. The stalks are not as tart as field grown but has the advantage of being available year round. 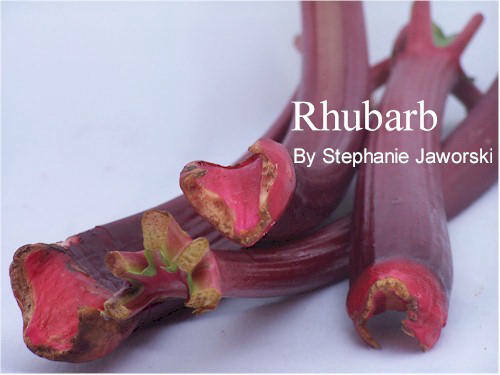 When buying rhubarb looks for crisp and firm stalks that have a nice bright color and are free from blemishes and cuts. The leaves, if still attached, should be fresh looking, not wilted. Rhubarb can be refrigerated in a plastic bag for a few days before using. Stalks will become soft if stored too long. Remove any tough and stringy fibers and brown spots before using. Can be frozen for up to six months. Simply wash, dry, and cut stalks into 1 inch (2.54 cm) pieces and place in a plastic bag. - Known as the "pie plant" in the United States. - Has a very intense tart flavor and quite a bit of sugar is needed to offset this tartness. - Sweet strawberries are often combined with rhubarb to balance its flavor. Apples, figs, pears, and raspberries also complement the flavor of rhubarb. - Spices such as ginger, cinnamon, and nutmeg go well with rhubarb. - Used to make sauces, jams, and desserts (such as pies and tarts).